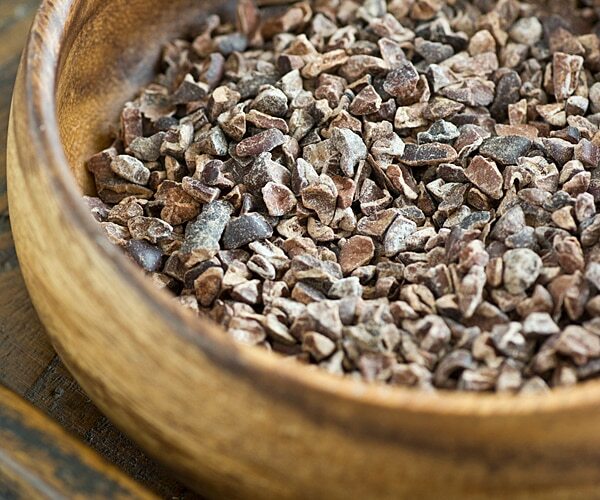 I am shopping online for cocoa nibs, and it appears there are two kinds – raw and roasted. Which one is best for this dish? The ones that I used just say cocoa nibs on the package, so I’m assuming they must be raw. I’d think that either would be just fine, though. Holy cow! This is an excellent combination of flavors! I ordered the sampler pack of cacao nibs online (at nuts.com), and they just happened to have the almond milk as well. I was skeptical because the nibs are slightly bitter when eaten alone. I used chia seeds because I was too lazy today to grind the flax seeds. 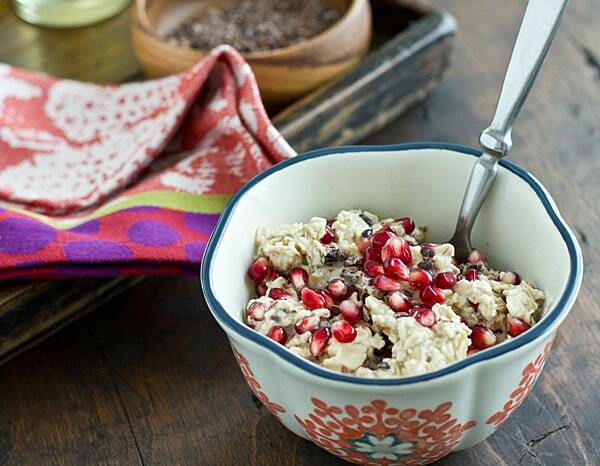 The result is a creamy concoction with just a hint of chocolate and bursts of refreshing pomegranate. It was very satisfying. I probably should note here, too, that I am not vegan or vegetarian, and I don’t usually go out of my way to buy organics, so this was a very interesting experiment for me. The result is: I will probably be eating overnight oats daily – at least throughout the rest of the waning pomegranate season. Now I’m going to try your other recipes. I’m so glad you enjoyed it! 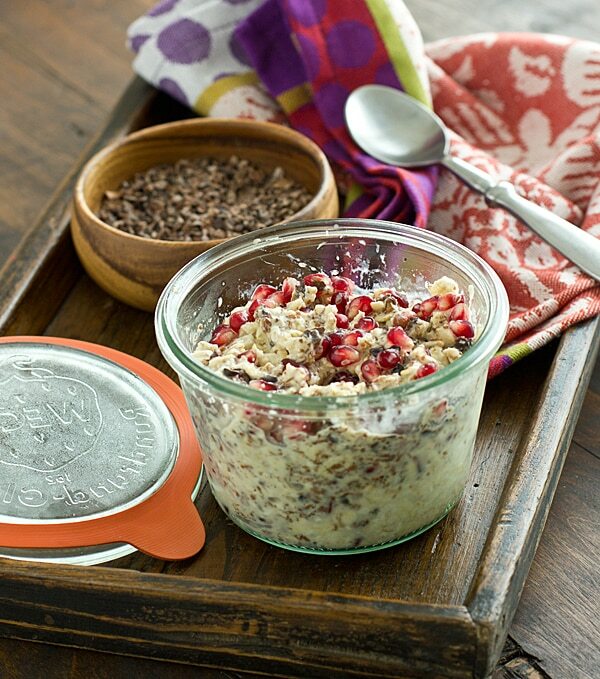 I make a few different kinds of overnight oat recipes, but this is probably my favorite. 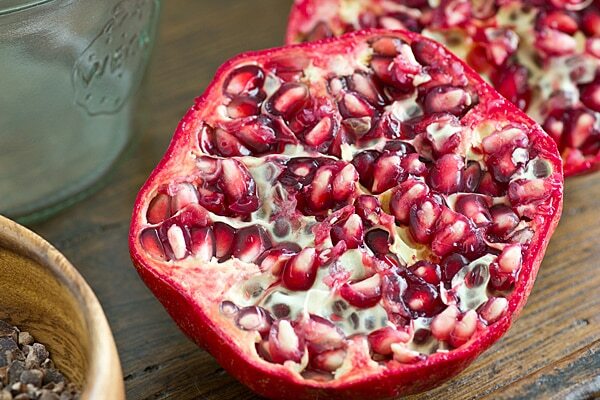 I’m going to be very disappointed when pomegranates are no longer in season! I’m interested in trying this. Do i microwave it in the morning or do you just eat it cold? You can microwave it if you like, but I prefer eating it cold. We must grow several hundreds of pomegranates every year on our property. We end up giving alot of them away and many still go to waste or rot before we can pick them, since who can use a hundred pomegranates all on their own. 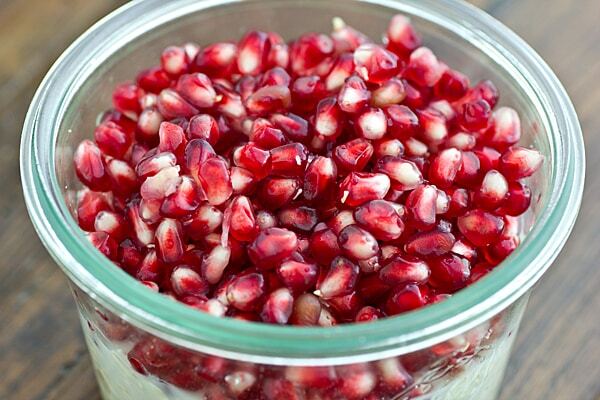 I really miss pomegranate season, I wish they stayed good longer. I’ve been making mine with cocoa powder (I do love it in the morning. it’s like the day starts with dessert! ), brazil nuts, chia seeds and brown sugar. I also like using greek milk instead of regular. The texture is just amazing! I love the idea of this recipe. Also, the bowl is gorgeous! Weird comment I love the jar your using where do I get one? ?